Financing is available for this boat. 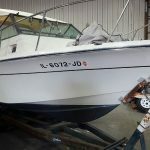 Click here for more information.Make an offer on this boat! We are just southwest of the intersection of Rt 14 and Rt 47 in Woodstock.